FC Barcelona travel to the Canary Islands to face Las Palmas on Sunday knowing there is no room for error as they pursue the league title with just two games remaining. Luis Enrique will be without Gerard Piqué, Aleix Vidal, Jérémy Mathieu and Rafinha through injury, as well as Sergi Roberto due to suspension. Lucas Digne received the all-clear from the medical staff after a recent hamstring injury and was named among the manager’s 19-man squad on Saturday, as was Barça B duo Aleñá and Marlon. The full squad for the trip is: Ter Stegen, Cillessen, Masip, Rakitic, Sergio, Denis, Arda, Iniesta, Suárez, Messi, Neymar Jr, Mascherano, Paco Alcácer, Jordi Alba, Digne, André Gomes, Umtiti, Aleñá and Marlon. Speaking during his press conference, Luis Enrique spoke of his admiration for Las Palmas who, in his opinion, “play some of the best football in the division” and stressed that Sunday’s encounter would be of “maximum difficulty”. Las Palmas boss Quique Setién called the upcoming clash “special” saying that it is his side’s last opportunity to show the fans that “what we achieved (in the first half of the season) was not by chance”. 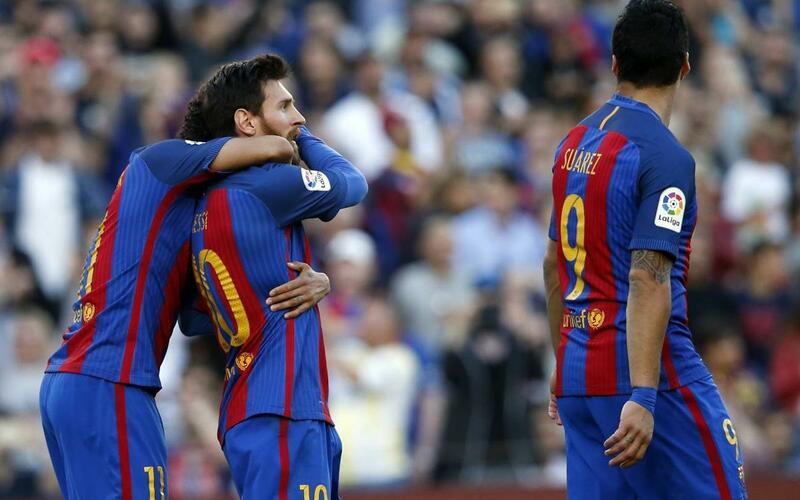 Barça go into the game on the back of five straight league wins since defeat at Málaga last month, scoring 20 goals in the process. Las Palmas, in contrast, have lost four of their last five games, and have scored a goal in over 300 minutes of league football. Barça have won five of the last seven meetings between the sides, which have been spread across a 17-year period due to Las Palmas’ long spell outside of Spain’s top flight. Since returning to the Primera Division, Las Palmas suffered defeat on all three occasions against Barça, including a 5-0 defeat in the fixture earlier in the campaign. Luis Enrique was a scorer against Las Palmas when the two sides met in 2002 at the Camp Nou in a 1-1 draw. The match will be shown around the world and you can find out where to watch it with our handy global guide. If for some reason you can’t get to a TV, don’t despair! You can always tune into our live English language commentary on Radio Barça via our website or follow the action on our official Twitter feed or our Facebook Live.